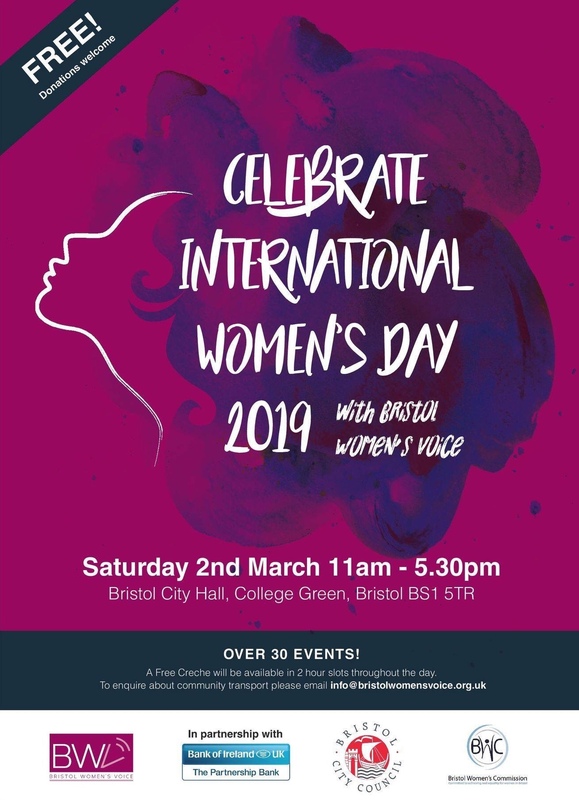 Bristol Women’s Voice’s annual International Women’s Day event will return to City Hall on Saturday 2 March 2019, 11 – 5.30pm. Join us for a free programme of exciting, diverse and informative events celebrating the wonderful women of Bristol (click here to view the full programme.). In partnership with Bank of Ireland UK, Bristol City Council and Bristol Women’s Comission. One-woman theatre performance Leave Without Rattling will share the inspiring stories of two pioneering women; Windrush icon, Bristolian and nurse Princess Campbell and Jamaican Nurse Mary Seacole. Performances from musicians including all-women brass band Burning Brass and Bristol University’s all female acapella group Pitch Fight will showcase women’s musical talents. Women and Power, a panel discussion with MP Thangam Debbonaire, PCC Sue Mountstevens, Youth Mayor Hannah Heir, Acorn Organiser Anny Cullum and Somali women’s group Tallo’s Founder Hibo, will explore women’s experiences of power and politics and the challenges that face us when we lean in. Workshops on menopause, maternity rights training and gender-based violence will tackle pressing issues that face Bristol women. A poetry open-mic will encourage women to share their voices and a collaborative wood-cutting workshop will bring women together to create a large-scale print. Feminist Archive South will exhibit dynamic, colourful posters from its collection of over 1000 and photography exhibition This Is Us will explore what it is to be a woman over 40. BWV will provide free transport for groups of women on a first come first served basis – to express interest for limited tickets email info@bristolwomensvoice.org.uk ASAP. A FREE creche is available in first come first served two-hour slots throughout the day (starting at 11am) and children are welcome to join in with activities (some may not be appropriate).